Ever thought of swimming with the Maine lobster? That’s exactly what Captain Denis Habza did when he put on his scuba gear and entered the BBS Lobster Trap Company lobster pound in Steuben, Maine a few weeks ago. Habza entered the water armed with a video camera and filmed what lobster life was like just below the surface at the Maine lobster dealer’s pound. Lobster pounds are large ocean pens or coves with significant water flow for live lobster storage. With an estimated 12,000 pounds of live Maine lobster in the pound that day, there was no shortage of “actors” to film. Habza is the founder of Squalus Marine Divers, a recurring, online marine video program, broadcasting internationally, via the Squalus YouTube channel. The program objective is to promote scuba diving in the North East while seamlessly integrating a message of conservation, education and stewardship of the sea. Steubin Maine is about 250 miles from the Massachusetts state line. This time of year, the pounds keeper buys soft shell lobster when lobster are plentiful and stores them for sale when their shells have hardened in September. In late summer and fall, lobster is purchased and stored for sale during the winter. The lobster is purchased directly at the pier from the fishermen. The fishermen can also purchase fuel and bait while they are offloading. The BBS Lobster Trap pound can hold more than 120,000 pounds of live Maine lobster ensuring ample supplies year round. This allows lobster lovers to order their favorite seafood even in the dark of winter. The lobster pound is a delicate ecosystem that requires aerating, feeding, cleaning and protection from ice during the winter. Bands are placed on the lobster prior to entering the pound to keep the lobster from harming one another. As Captain Denis points out in his video, “lobster don’t like other lobsters.” And based on the video, they don’t like divers either. The lobster in the video get very aggressive. The 2012 Spring and Summer lobster season has seen an abundance of low quality, soft-shell lobster flooding Maine and Massachusetts markets. This has created a great deal of confusion for lobster lovers who see news reports of record low prices for soft-shell lobster. The problem is that this crop of soft shell lobster — or “shedders” — is very soft and can not be shipped any distance or successfully kept in holding tanks. The “extra soft” shedders are in a super weakened state and mortality rates are twice as high as normal. They will last only last a few days in a holding tank and they experience double or triple the normal mortality rate even when shipped just a few dozen miles. Hard shell lobster are the only choice when shipping lobster longer distances as they travel better because they are healthier and stronger. For home delivery, always demand hard shell lobster. The 2012 live Maine lobster market confusion is being caused because 80% of the daily catch in Maine and Massachusetts is soft shell lobster instead of a more normal 60-40 summer split. Shedders arrived early in 2012 and the over supply of soft-shell lobster are being sold at a loss to Canadian processing plants. The overflow is flooding Maine and Massachusetts restaurants and supermarkets. Meanwhile, the demand in the rest of the country for hard-shell lobsters is over the top while supplies are abnormally low causing hard-shell prices to rise. For local lobster lovers and processors, the low shedder prices are a boon. For the fisherman, dealers and wholesalers, not so much. Many fishermen are complaining its not worth going out and wholesalers have no space to hold the glut of soft shell lobsters. On the upside, the quality this season of hard-shell Maine lobster is excellent, according to Lobster Trap Company Sales Manager Dave Madden of Cape Cod. But soft-shell lobster shipping mortality rates aside, the truth is aficionados prefer hard-shell lobster because of the meat texture and the taste. The meat is firmer, flavorful and is more easily grilled or baked. Meat from a soft-shell lobster is often watery and stringy though some people think there is a special sweetness to the flavor. But you can’t put a soft shell lobster on a grill as the meat will often fall apart. It can be tricky to bake-stuff one as well. Hard shell lobsters are often desired as they offer more meat per pound. A soft shell lobster will have more water weight than a same-size hard shell lobster. That is because after a lobster molts, or sheds its old shell, the new shell underneath is larger. Until the shedder grows into that new shell, that extra space is usually filled with water. But in truth, you will find some local folks in Maine who prefer the shedders for their taste and ease of eating. A post-molting lobster in its weakened state is not considered low quality. They just don’t transport well and are not expected to be crammed full of meat. The price per pound is often less as well and when eating, their shells are more easily opened. 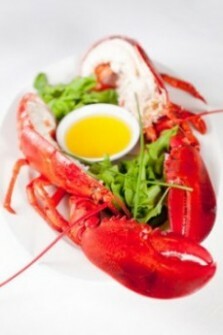 However, when ordering for home delivery one should always demand hard-shell live Maine lobster. Even in normal times, a soft-shell will lose water weight in transport and there is a very high risk the lobsters will perish en route. Quality lobster delivery services will rarely, if ever, ship shedders for home delivery. In order to grow, an adult lobster will shed its old shell dozens of time during its lifetime (females more often than males). The lobster grows a new shell beneath the old one. When it molts, the old shell splits along the back and the new shell is like a thick skin, soft enough to allow the lobster to twist and wiggle itself free from the old shell. It is not unusual for the lobster to then feast on the old shell to help quickly regain the lost calcium. Molting is most common when the Atlantic Ocean begins to warm in June. The new-shell season will run all summer through October and beyond, depending on the drop in water temperature. Over the winter the new shell will harden and become next season’s hard shell lobster. The question of hard shell vs. soft shell is usually one of preference and opportunity. For connoisseurs, the lobster eating experience is not complete unless you have to work to crack and pick the shells apart to get to the succulent meat inside. For those people, hard-shell lobster is always the way to go.